A fast growing, drought tolerant vine that quickly creates a burst of brilliant color and a lush natural look in nearly any location. This vine is a vigorous spreader that can be pruned freely to maintain the desired size and shape. 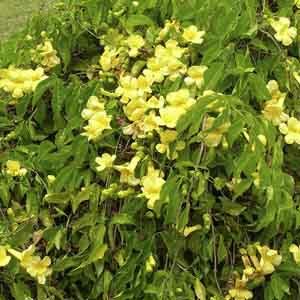 The common name "Cat's Claw" refers to the vine tendrils that resemble claws and cling tight to just about anything. Take care to put this plant in a location where it can spread without attaching to surrounding plant. Isolated barren walls and fences are ideal locations, or contained in a large planter with a trellis. Great for growing on a trellis or lattice to create a quick, natural-looking screen. Also useful for hiding unattractive walls, fences or stumps. Drought tolerant but performs best with regular watering during dry spells. Prune freely to keep plant desired size.